Watch the amazing lift-off of the spacecraft! We take on a group for the launch on July 20, 2019 — the Soyuz MS-13 spacecraft (Aleksandr Skvortsov, Luca Parmitano, Andrew R. Morgan). To take part in the tour you need to send in your application to info@vegitel.ru along with the participants’ data and the passport copies (the 1st page). Stardart Baikonur tour 5 days (4 nights) – 3950 Euro per pax. VIP Baikonur tour 5 days (4 nights) – 4800 Euro per pax. We can either arrange an abridged tour program or a program without flights for you if necessary. Thus you get to Baikonur yourself the most way comfortable for you while we arrange your stay in Baikonur and the implementation of the program. We can also offer a tour with the accommodation in Tsentralnaya hotel (Soviet type 2* hotel, no wi-fi). In this case, the cost of the tour will be 2700 Euro. Our company offers you a unique opportunity – an amazing trip to the Baikonur cosmodrome during manned and unmanned launches of spacecrafts. This exclusive program of the Baikonur tours will bring you unforgettable impressions and emotions because you’ll have a chance not only to visit the famous cosmodrome, launch pads, integration and checkout buildings, museums and historical places, but also to witness all the stages of preparation for the launch – the roll-out and the installation of the rocket, the cosmonauts’ farewell ceremony, the space crew ready-to-go official report, pre-launch excitement and finally you’ll observe a historical moment – the launch of the rocket. We invite you to join our VIP tour to Baikonur cosmodrome! A unique adventure arranged by experienced aerospace tourism professionals guarantees you unforgettable impressions and comfortable stay in Baikonur. Choosing this special offer you will definitely find an individual approach to every customer, ongoing support and assistance of our English-speaking coordinator, accommodation in the best hotel of Baikonur city, comfortable transport vehicle for a small VIP group (up to 12 participants), full board, souvenir package, individual excursions and guides’ services. This is a preliminary program. The time and order of visiting the facilities of the Baikonur cosmodrome can be changed because of the specificity and technical features of this complex. Besides, the duration of the program depends on the date and time of the rocket launch, so each program is always adjusted for the particular launch. Please, contact our specialists for more details. In addition to the basic program in Baikonur, we can offer you a visit to Gagarin Cosmonaut Training Centre (various excursion programs, training on real space simulators, corporate programs), to visit the museum of Air Force, the Memorial Museum of cosmonautics, Moscow sightseeing program. You should send in your application at least 35 days before the visit of cosmodrome Baikonur with special questionnaires and copies of passports of all the participants enclosed. The program should be paid at least 14 days in advance according to the contract and the invoice. To participate in the tour to Baikonur it is necessary to obtain a double-entry Russian visa, Kazakh visa is not necessary. Thank you for a wonderful tour to Baikonur. I enjoyed all items of the itinerary and soaked up all the space rocket history there is at both the Cosmodrome and in town. Thanks very much to the team who looked after us, security (Olga), tour guides and the respective museum guides, teachers (international School), and launch site ( Proton) staff, all of whom did a great job. I enjoyed the staff, food and facilities at the Sputnik Hotel which was great. Overall, the tour experience was above my expectation and I just wanted to say thanks. As well we would like to say THANK YOU very much for this very, very special and fazinating time in Baikonur – we will never forget this trip and we will keep all the impressions in our heart our lifetime. A brilliant experience, if you’re interested in space flight this is a tour you should do! Our guides and tour organisers — Ksenia, Elena and Anna — were excellent…. well organized, knowledgeable and attentive. Plenty of visits and activities arranged for each day ….all the guides in the cosmodrome highly knowledgeable about their specialism. The ‘after launch’ chocs and russian champagne on the coach back..were a enjoyable suprise! Thanks again for a unique vacation!! It was a pleasure to travel with you. Due to your excellent English language it was easy to follow all your detailed information about Russian space flights. Everything was perfect organized. As a German resident I traveled on my own from Frankfurt via Astana to Kyzyloda. On this route an extra Russian visa was not necessary. From Kyzyloada airport we travelled together with the complete group to Baikonur. 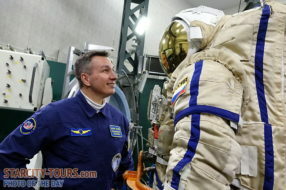 The Soyuz MA-09 launch tour was very varied. My personal highlight was watching the international Soyuz crew in front of the “Cosmonaut Hotel” early in the morning. Beside Sergei Prokopyev (Russia) and Serena Aunon-Chancellor (USA), our German astronaut Alexander Gerst was a member of the crew. Also the transportation of the Soyus rocket to the launch pad, the preparations of the rocket and the launch was impressive. The City of Baikonur was safe, the residents very friendly and curious to know about us tourists. I had two amazing experiences, one to witness and experience the tension and exhilaration of the landing of MS07 Expedition 55 on the steppe. And two, wit a dash across Kazakhstan to the Baikonur Cosmodrome for the Launch of MS09 Expedition 56. My entire Vegitel adventure ran to plan, right on time always. It was also for us a pleasure to meet you! Your team did an excellent job on-site! We enjoyed every single Moment of the tour. Beside the great and professional organization of the tour itself, your team was also a huge help and support for ALL requests raised by the tour participants. I also explicitly support the emotional but good reaction regarding those tour participants who did not behave so well. I would recommend to all people who are interested to witness a rocket start in Baikonur the Vegitel team! It was not just a tour, it was a mission! The Vegitel team made it complete! Please accept my thanks for the good work you, Anna, and Ksenia did during the recent tour to Baikonur. Everything (except maybe for the long bus rides) was very interesting and well presented. I will not hesitate to recommend Vegitel to my colleagues. Feel free to use our contact form to send an online message. We will answer you shortly. The Baikonur Cosmodrome is a complicated engineering and technical complex, it is the world’s oldest and largest operational space launch facility. It is located in the desert steppes of Kazakhstan, about 200 kilometers east of the Aral Sea, north of the Syr Darya river, near Tjuratam railway station. The cosmodrome occupies the total area of 6717 square kilometers. It was originally built by the Soviet Union in the late 1950s as the base of operations for its ambitious space program, but fell into decline in the years after the collapse of the Soviet Union in December 1991. Later on, it was leased to Russia by the Kazakh government (currently until 2050) and today it is managed by the Russian Federal Space Agency. Sputnik – the world’s first satellite – was launched from this cosmodrome (1957), and since the first human space flight of Yuri A. Gagarin onboard the Vostok spacecraft ( April 12, 1961) over 1.200 spacecrafts were launched into the universe from this port. Baikonur is fully equipped with all the facilities required to launch both manned and unmanned space vehicles. It supports several generations of Russian spacecrafts: Soyuz, Proton, Tsyklon, Dnepr, Zenit, and Buran. During the temporary lapse of the United States’ Space Shuttle program after the Columbia Disaster in 2003, it played an essential role in operating and resupplying the International Space Station with Soyuz and Progress spacecrafts. Nowadays the Baikonur cosmodrome is open for international cooperation in the sphere of space exploration and for the insertion of manned international orbital complexes of a new generation to orbit.